Maybe I have a thing for exotic burgers, or maybe it's my love of donuts, or maybe it's my fascination with odd sounding dishes that I can't even eat on account of the unkosher animal in them (oink oink) that I then refashion so I can eat, but whatever the reason, the Krispy Kreme Bacon Cheddar Cheeseburger definitely got my heart a-racin'. Someone posted the above pic to Flickr, and then it was featured in the NY Times. 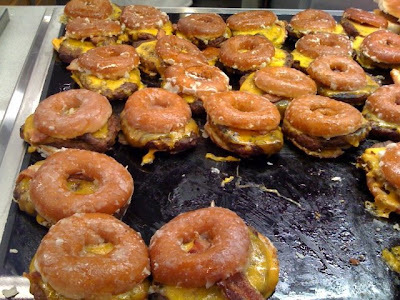 A Luther Burger is a hamburger, specifically a bacon cheeseburger, which employs a glazed donut in place of the bun. According to legend, the burger was named for, and a favourite (and possibly invention) of the late singer-songwriter and record producer, Luther Vandross. And there you have it, a savory use for a donut. I think dinner tonight is going to be a turkey sandwich on chocolate cake. Obviously, there's nothing wrong with that! Tzviah - It has 350,000 calories and 1 million grams of fat. But maybe you can cut back on the bacon and it'll be more heart healthy? I am repulsed looking at that. It's so... wrong! aj - and yet it's so...intriguing and grossly delicious-looking!